The impending ISO 9001:2015 revision, which is proceeding through various stages, has prompted questions by many of our certified clients and readers. Until the final standard is published at the end of 2015, it is hard to know everything that will stand. As of January 2015, it appears that the new structure (10 clauses) and the focus on risk-based thinking will remain. Implementation and audit perspectives are still to be resolved. You can read a previous article on our blog about the changes as they were published with the DIS. We felt it was important to create a landing page with a clearinghouse of “available to the public” news releases, supporting documents, presentations, commentaries and videos from ISO.org and other thought leaders such as CBOs like NQA and stakeholder organizations like ASQ (The American Society for Quality). We will update this page throughout 2015 as new resources are posted. On this page, you will also find information on upcoming webinars that we’re offering in 2015 to help clients strategically prepare for the new standard. These webinars on ISO 9001:2015 and ISO 14001 are complimentary resources that we encourage you to take advantage of. 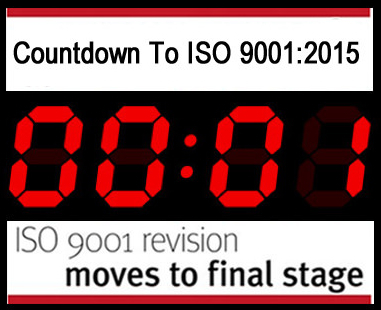 It is important to note that the ISO 9001:2015 revision has a way to go before publication and the new version of TL 9000 (R6.0) can’t be fully developed until the final ISO 9001 revision is published. Once published, new organizations will have 3 years to transition their quality management system over to the new version(s). That being said, education and preparation are things you can do now, which is why we’ve developed this resource, so bookmark this new page! BIZPHYX will be there to assist clients with all aspects of the revision, including new implementations to the latest version. For more information on ISO 9001, ISO 14001 or TL 9000, please contact info@bizphyx.com. In Chinese Astrology, they say that 2015 is the “Year of The Goat”. For those of us in the realm of quality management, we’re affectionately labeling 2015 as “The Year of Quality”. This is primarily due to the new update of ISO 9001:2015, which is projected to be published at the end of the year. Here’s a quick recap on where things stand, as it seems like the last 2 months have been a blur. We went from the QuEST Forum Leadership Council and Work Group meetings straight to a flurry of year-end implementations and training projects, just as ISO announced critical new timeline updates for the new ISO 9001:2015 standard. The New Year kicked off with the QuEST Forum Leadership Summit where new ICT quality initiatives we announced. Then the ISO/TC 176/Sc 2/WG 24/TG 5 committee, responsible for the ISO 9001:2015 revision, began working through some important member responses to the FDIS. Like we stated, 2015 is going to be a very busy year in the world of quality management. The ISO 9001:2015 revision will impact other standards and there is much complexity to the update as defined in previous articles on our blog. For example, standards like ISO 14001 (environmental management) and ISO 27001 (information security management) will share the new alignment. Ultimately, TL 9000, the ICT quality management standard will be updated (TL 9000 6.0) to incorporate the new changes in ISO 9001. Recently the ISO/TC 176/Sc 2/WG 24/TG 5 committee published their Validation Report, incorporating and scoring comments from member organizations that have the duty to provide input (both positive and negative) about the proposed revision. In the USA, ANSI provided critical input, for the UK, BSI submitted detailed comments and other global member organizations such as SCC (Canada), AFNOR (France), DGN (Mexico) and BIS (India) all contributed to the Validation Report data. At this point, the comments are now being reviewed by ISO and its up to the committee to acknowledge and address the input. Right now things are fluid, as the ability to “audit” risk based focus and activity is being weighed. This standard aims to provide general guidance for outsourcing for any organization in any sector. It provides a general vocabulary for outsourcing practitioners across all industry sectors. It includes typical outsourcing concepts to improve the understanding of all stakeholders, by providing a set of practices that can be used to manage the outsourcing life cycle. This International Standard establishes commonly accepted control objectives, controls and guidelines for implementing measures to protect Personally Identifiable Information (PII) in accordance with the privacy principles in ISO/IEC 29100 for the public cloud computing environment. This provides detailed technical guidance on how organizations can define an appropriate level of risk mitigation by employing a well-proven and consistent approach to the planning, design, documentation and implementation of data storage security. In our rapidly changing world, ensuring cities and communities are fit for the future is a key priority for many city leaders. Providing sustainable energy supplies, coping with environmental and climate changes, building and maintaining durable infrastructures and meeting the needs and expectations of citizens is the focus of this new standard. As you can see, nothing is slowing down in the world of quality management as it pertains to ICT, the cloud, data security and sustainability. So stay tuned, there’s much more to come in 2015 and we are creating a resource for our clients to check in on the latest updates on the ISO 9001:2015 revision. For more information on ISO 9001 or implementing any of the standards above, please contact info@bizphyx.com. As many of our clients are aware, ISO 9001: 2008 is under revision. ISO 9001 is one of the most widely used ISO quality standards. The proposed revisions have worked their way through the Working Draft (WD) and Committee Draft (CD) stages and are now available as a Draft International Standard (DIS), a key milestone in the revision process. Since changes to ISO 9001: 2008 will impact other quality standards like TL 9000 and ISO 14001 (as examples), we like to keep to readers aware of the potential changes and impacts to their existing quality systems. As active members in QuEST Forum the governing body over TL 9000, we can report that organizationally we’re waiting to see what changes occur with ISO 9001 before significant revisions are made to the current TL 9000 quality standard. Since TL 9000 is the ISO based quality standard of the ICT and telecommunications industry, changes to ISO 9001 may have an impact on the standard as well. We felt the timing was right to provide our readers with relevant information, as well as source material on the revision process and the proposed changes, especially coming off of the recent ASQ Conference on World Quality. Everyone is waiting to see how much of the DIS will be upheld and what we’ll have to work with in 2015. Like all ISO standards, ISO 9001 is reviewed every five years and is now being revised to ensure it is relevant and up-to-date. At the DIS stage all interested parties can submit feedback that will be considered before the final draft is published by the end of 2015. After public comments are collected, the revised standard will work its way to FDIS status (Final Draft International Standard), which is expected to take place by July 2015, with the published standard targeted for September 2015. Once the new standard is published in September (or by the end of December 2015), there begins a 3-year transition period for implementation to the revised standard. It’s important that the standard remain relevant with regard to changing times, products and services and evolving economies of scale. As a result, ISO wants to develop a more consistent foundation for the long-term (25 years) and one that will facilitate better integration among all the various quality standards. Certainly it is ISO’s goal to increase adoption of the standard and to do so, it is necessary to address the rise of service organizations (vs. manufacturing) and the technological changes that impact the way we work in terms of telecommuting and the “virtual office”. —Organizational Context. A new clause that will require the organization to define itself, determine internal and external issues relevant to its purpose and that affect its ability to achieve the outcomes in their quality management system. It’s a new way of viewing the QMS. (DNV-GL Business Assurance is a global certification body headquartered in Milan, Italy. Our CEO participated in this live webinar overview in 2013). (Burt Holm, Northern District Sales Manager for the USA facilitated this. We think it’s excellent and have posted it on our Knowledge Base). (From the ASQ TV channel as featured during their recent Conference On World Quality). We will keep our readers aware of any updates to the process as they occur here on our blog and on the BIZPHYX Knowledgebase. The most important thing you must consider is that change is coming and some believe for the better. Learn about theses changes as you see fit. Evaluate whether or not these changes will impact your organization. Open a discussion with your quality consultant or Registrar. There will be time once the final standard is published to revise your quality system before the transition period (3-years) is complete. For more information on the ISO 9001: 2015 revision, contact info@bizphyx.com.